Stadium comes first, and then comes the team. Built in 1956, Luzhniki Stadium has turned into a legendary battlefield hosting Russian National football team. The stadium depicts team’s glorious history and is the home of 81,000+ of its dedicated supporters. Luzhniki Stadium is the largest football arena in Russia and one of the biggest stadiums in Europe. The venue boasts increased capacity after its renovation in 2013. The reconstruction made it possible for the stadium to become a flagship when it comes to upgrading facilities, playing conditions and advanced visitors’ experience. The arena traditionally hosts all major UEFA tournament matches featuring Russian National team. Luzhniki arena has a typical stadium structure. The shape of a bowl with several entrances makes it easy for visitors to get to their seats effortlessly. 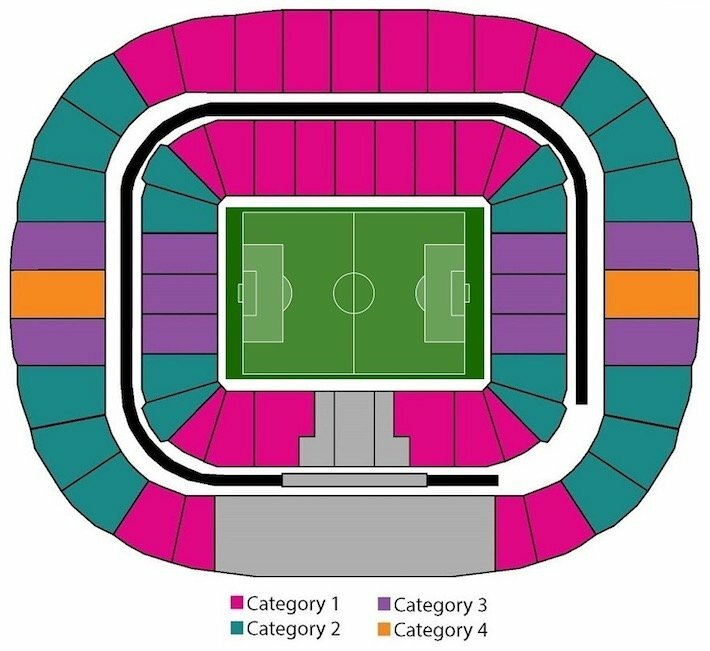 All seats are divided into 4 main categories regardless the upper or lower row, although the price is often lower when it comes to upper-row seats. Sector 1 is the main part of the stadium that hosts most of the long-side seats. The Southern sector is for local supporters. It refers to tickets categories 2, 3 and 4. The northern sector is for guest visitors. It also includes three ticket categories from 2 to 4. The section with the main entrance hosts seats for the VIP and special guests as well as so-called sky-box category seats with maximum comfort and servicing. Note: smoking and drinking alcohol is prohibited. You can buy only non-alcoholic drinks and snacks inside the stadium bowl. Thanks to StubHub buying tickets is easier than ever before! Simply choose a necessary date and benefit from a wide range of offerings to meet different budgets. The service lets you book and purchase tickets in seconds! Simply make several clicks and get your e-tickets right to your email. If you prefer visiting the official website of the stadium, here you can find schedules and match timetables. The page includes a simple online ordering form where you can fill in the contact information and send a request. Category 3 tickets range from €543.93 to €522.50. As for Category 4 tickets, they are usually sold out. So, you need to specify their availability using the contact information above or visiting the official website. Benefit from one of the most trusted and fast ways to reserve a room. Booking.com has plenty of great offers to stay in Moscow for one or more nights. Simply check our list of cheapest and top-rated hotel offerings to save time. Hostel Mint – a good option for those who value for great location and stadium accessibility. It takes 18 minutes to walk from the venue to the arena. Gorky Park and Ploshchad Gagarina metro station on the central circle sound nice for only $8 per night. Guest House Slava Luzhniki – another great alternative for those who want to put an ease on the wallet. A separate double room will cost you $79 per night. The stadium is about 10 minutes walk from the hotel. Cathedral of Christ the Saviour with some other places of interest is nearby as well. Blues Hotel is certainly worth spending $126 per night. The price includes a superb breakfast in addition to 24/7 reception, free Wi-Fi, and great location. The hotel is right next to Sportivnaya metro station. Hotel Olimp looks promising considering only $74 for a one-night stay in a double room. Breakfast is already included in the price while the stadium is about 10 minutes walk from the venue. Hotel Korston Moscow – the hotel offers great breakfasts and multi-lingual staff available 24/7. Guests do not have to rush to the dining room early in the morning. They serve breakfasts until 5 p.m. $173 per night looks more than reasonable. Khamovniki Spektr Business Hotel – a good place to stay for a night and get an access to all major attractions and places to see. It will take you about 10 minutes to get to elite Moscow-City district, Expo Center and other popular spots. One night in the hotel will cost you $114 along with a superb breakfast. The stadium is a part of the Luzhniki Sports Complex facilities and has actually the same address. The arena is located 6 km south-west of the city center. Surrounded by Moskva River and parklands, the arena boasts a great location accessible from two different metro lines. Vorob’yovy Gory station is alternative for those who want to walk about 15 minutes enjoying the scenery. Both stations refer to the red metro line 1. It will take you about 10 minutes to reach them from the city center (Okhotny Ryad or Biblioteka metro stations). One metro ride will cost you about $1 despite the destination or region you need to get to. By Bus – taking a bus will hardly be a good option. It will be more time-consuming if considering traffic jams. The tube is still a better alternative unless you need to get to the stadium from Kievsky railway station or Belovezhskaya street. Buses № 157 and 132 will take you directly to the Luzhniki Stadium. The ticket costs $1 (the price is equal to metro tickets). By Taxi – once you want to travel by Taxi, the average price to get to the arena from the city center is about $15. It may range depending on the service you choose as well as routes. However, the average price per hour is about $15. This is how much you will need considering traffic jams and congested roads, especially on the matchday. By Train – Moscow welcomes its visitors who arrive at any of 9 major railway stations. 3 of them are located in the downtown next to metro stations. By Plane – Moscow boasts 5 airports. Three of them accept international flights on daily basis. They include Vnukovo, Domodedovo, and Sheremetyevo. Once you arrive, you can take a special train or bus that will take you right to the city center. The price of Airexpress tickets ranges from $10 to $150 depending on the category. You can check the available tickets and prices on the official website. And make sure you book your flight in advance using the fast and simple registration form. A large parking zone is available for the fans on a matchday right at the venue. However, if you cannot park there for whatever reason, there is always an alternative solution. The approximate matchday paid parking price near the sports ground in Moscow is $5. Moscow offers a diverse selection of venues including restaurants with Russian national cuisine in addition to Asian-style and European cafes, sports pubs and other places to eat out right near the stadium. Red Woody – a good place to have a snack before the match. The venue serves a selection of burgers and pizzas. It also boasts a fine selection of local and imported beers. The customers appreciate cozy design and professional staff. Choice Moscow – a loft-style venue features an open terrace where you can benefit from an amazing 360-degree rooftop view. It will take you not more than 10 minutes to get to the venue from the stadium. ShtirBeer – a traditional pub that highlights a wide selection of local and foreign beers. Visitors appreciate a selection of crafts and beer snacks. Perfect place for a company of football fans. The venue also offers special coupons and discounts to put an ease on the wallet. SOHO – one of the most glamorous and posh Moscow restaurant chains. SOHO rooms are the place where local and foreign celebrities spend time enjoying premium-quality cuisine delivered by best chefs. Golubka – you would hardly find a cozier place near the stadium. The venue welcomes guests to try authentic Russian cuisine in addition to branded meals prepared by local chefs. Professional staff, affordable prices, and great interior will certainly make your day. Bavarius Restaurant – a place for true beer lovers. The venue reminds of good old German beer restaurants featuring a long list of beers in addition to traditional Bavarian snacks and main courses. The arena traditionally hosts major sports events in addition to music shows, festivals and more. At the same time, visitors can benefit from several types of stadium tours. You can choose from a selection of sports activities and try yourself playing tennis or visiting the local aqua center. Shortened stadium tour lasts 30 minutes. Adult tickets cost $5, children –$4. Major excursion usually takes about 90 minutes. Adult tickets cost $12, children –$9. The museum opened its doors to first visitors in 1957. For more than 5 decades, it has been keeping the sports heritage of several generations. The museum is currently located next to the VIP seats. Here you can learn more about the biggest sports achievements in Russian and Soviet history, meet legendary athletes and show respects to the monument of people who died in stadiums across the world. The museum is open from Sundays to Mondays. The working hours are from 10 a. m. to 6 p. m. Foreign visitors should pay $5. For Russian residents, the price is lowered to $2. Moscow is a modern city with the intensive life rhythm. Nevertheless, it still reserves some space for enlightening through historical places of interest, galleries, museums, monuments, and attractions for any taste. Start to explore the city with the general sightseeing tour and keep in touch with the most popular places in Moscow. Tourists appreciate hop-on hop-off tours that are available in many cities around the world. Moscow is not an exception. It is a good way to learn more about the city as well as its main places of interest, main streets, and beautiful squares. The price starts from $18. As a rule, programs include free walking guides in addition to 60 minutes of top open bus explorations. The tour is available between April and October, from 11 a.m. to 8 p.m. You will visit the bend of the Moskva River near the Kremlin, drive through the First and Second sluice bridges and hop off at the Red Square. The Red Square – it is the heart of not only Moscow but also Russia. It is one of the most visited places in the country. The venue looks amazing surrounded by architecturally stunning buildings, towers, and constructions. Once used to be a market square, the place now is the center of Russian history and culture. The Kremlin – it is one of the biggest existing fortresses in Europe that is still in action. Here you will come across 18 different buildings to explore. They are hidden behind the 2,235 meter-long Kremlin walls. The place hosts 20 different towers featuring cannons and the biggest bell in the world. Arbat Street – it is the main and yet the oldest street in Moscow. It has become a #1 tourist attraction over the years. It looks both elegant and historically attractive. Guests can watch street performers, enter cozy souvenir stores, visit theaters and witness major monuments.